Quote Reply Topic: Adder 2007! Hi all, thought I would kick-off a new adder piccy thread for 2007 as the old one takes a bit of time to wade through. 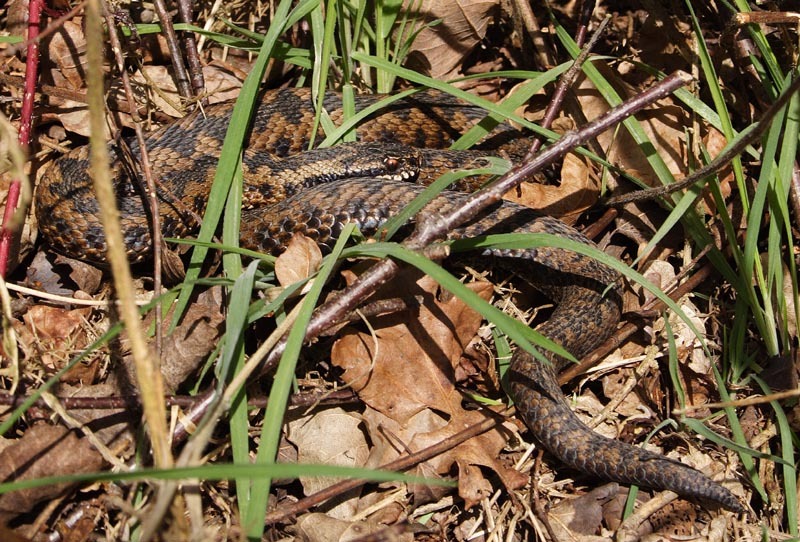 Good day today, 15 adult male adders at my local site + 1 sub-adult and 2 adult male Vb and 2 Lv at an adjacent site. This guy is now an old friend, third year in succession. brill were was these taken at? lol not saying site.its ok i understand. Hi James, if you were ever in East Anglia I would be happy to take you over to the site, I just don't really want to draw attention to it as the snakes have enough problems with unsympathetic management. Jon C, Have the management team (BW) been advised to put in brash piles near the main hibernacula? There seems to be several piles that have appeared. If this is the annual 'bonfire' than this year they must be stopped. There are snakes using and adjacent to the piles. Edit. Maybe a touch early for birds nesting I suppose, but certainly still a dangerous time for emerging reptiles. Nice one (or eighteen!) Gemma. I had high hopes for today, starting off as it did with bright blue sky and rapidly rising temperature. But the weather didn't quite deliver in the end, not getting above 11C and clouding over by the time I was able to check my local Adder site early this afternoon. So still no Adders this year for me and no Common Lizards or Slow Worms yet under the refugia which Mark and I put down at Christmas. My first and only reptile sighting this year was a Common Lizard at an adjacent site in mid-January. But there was a pristine Red Admiral butterfly out in the garden this morning, flying around the cherry tree blossom. We have a Derbyshire site which showed a dramatic decline last year, but which is showing some signs of recovery this year - or so it seems. It may just be that new animals are moving into available territory at hibernation time. John, I would say at this site we have one main area, comprising of three distinct hibernation hot spots that are all part of one continuous bank. I'm confident that all these animals hibernate here habitually. The sub-adult was a surprise though as I have not seen any with the adult males at this site before but it confirms recruitment. There are also individuals in scattered locations, if only I could get good ID pictures from this site (see below) because it isn't clear to me if these are early dispersals or animals emerging from discreet hibernacula. Tony, I'm back up to speed with handling, unfortunately we have 'issues' at this site and I have no official permit for working on the site. This rules out handling and good quality ID shot, mainly because of the nature of the bank which provides ideal conditions for mosaic basking, getting good shots of the heads is almost impossible without capture. I've now got quite a few individuals at this site that I can reconise from a distance though and a few with photo ID but it is difficult to be consistent without being able to collect full data.